Archaeologists at the Roman Vindolanda Fort & Museum have unearthed dozens of circular huts which they believe could have been used as temporary refuges. The excavation at the site in Hexham, Northumberland, has unearthed various finds from Roman Britain including letters, murder victims and shoes. It is thought the huts were built during the invasion of Scotland under Emperor Septimius Severus (AD 208-211). Dr Andrew Birley described them as "remarkable structures". An earlier fort at Vindolanda was completely levelled for the construction of the buildings, which could number into the hundreds. The find has intrigued archaeologists at the site as Roman soldiers did not build round houses. 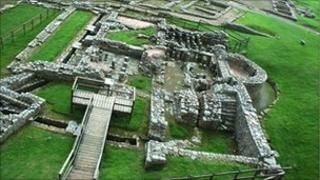 They are interested as to why the Roman army would go to such lengths to accommodate the unusual structures. Dr Birley, who is director of excavations, said: "These are remarkable structures to be found inside a Roman fort, unique in fact. "They are the sort of building you might expect to find north of Hadrian's Wall in this period, used by small farming communities. "It is quite possible that what we have here is the Roman army providing for these farmers - creating a temporary refuge for the most vulnerable people from north of the wall. "Those people may have helped to feed the army and traded with the soldiers, and would have been regarded as being traitors and collaborators in the eyes of the rebellious tribes to the north. "It would make a certain sense to bring them behind the curtain of Hadrian's Wall and protect them while the fighting continued, as they would have had real value to the Romans and they certainly tried to protect what they valued."